… or, Who Has Been Plowing Up The Park? After not going there for some time, yesterday I made it back to Almaden Quicksilver County Park for a hike up the Deep Gulch Trail to the ridge near the old mine buildings. I like this trail because it is a very direct route, heading pretty much straight up to the old English Camp site. I was surprised by light rain – not in the forecast – but it cleared as I neared the ridge. On the way up I noticed a few areas that looked like they had been worked over by some heavy equipment. I wasn’t quite sure what this meant, but it did look like the non-native and quite invasive (Spanish? Scotch?) Broom plants had been cut way back. About time! I didn’t think much more about this until near the high point of my hike. At English Camp, instead of ascending to the main ridge on the Castillero trail I took the foot trail that cuts off to the left and arrives on the ridge a bit lower. Arriving here I briefly looked around before starting back down – I was running a bit late. As I started back down the trail I looked to my right and saw two large road cuts through a grove of trees on a nearby ridge – and I decided to investigate. 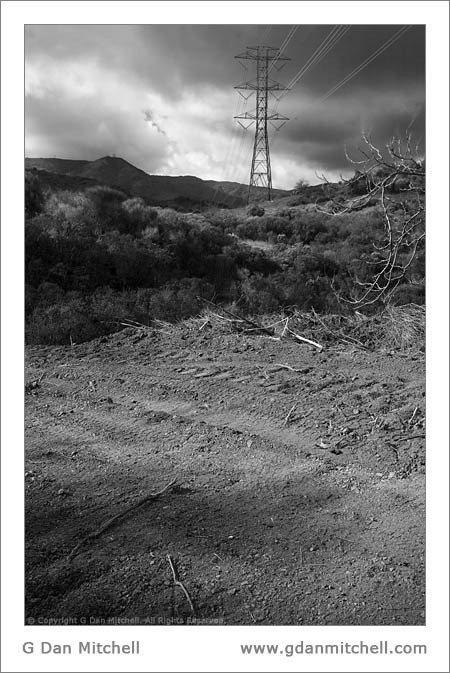 After hiking up one of them, it looks like whoever maintains the high tension power transmission lines that cross that park has seen fit to bulldoze what amounts to a two-lane dirt road straight through the brush to their towers. Pretty ugly stuff. The following photo is what I think of as an “ironic landscape,” since it is the view one currently sees from the ridgeline trail of this park. Newly Gouged Dirt Road and Tower of Power. Almaden Quicksilver County Park. December 1, 2007. © Copyright G Dan Mitchell.